Topshop makeup has gone from strength to strength since it's launch and rightly so. 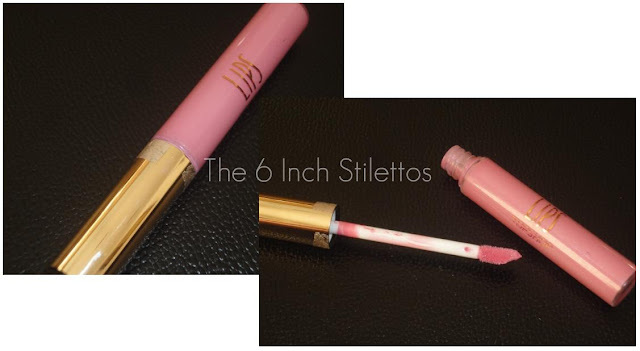 The quality is good and it's quite cheap considering there is such a huge range of products. From eyeshadows to blushers, the range covers all the bases and appeals to everyone so it would be hard not to find something in the entire collection that you don't want. 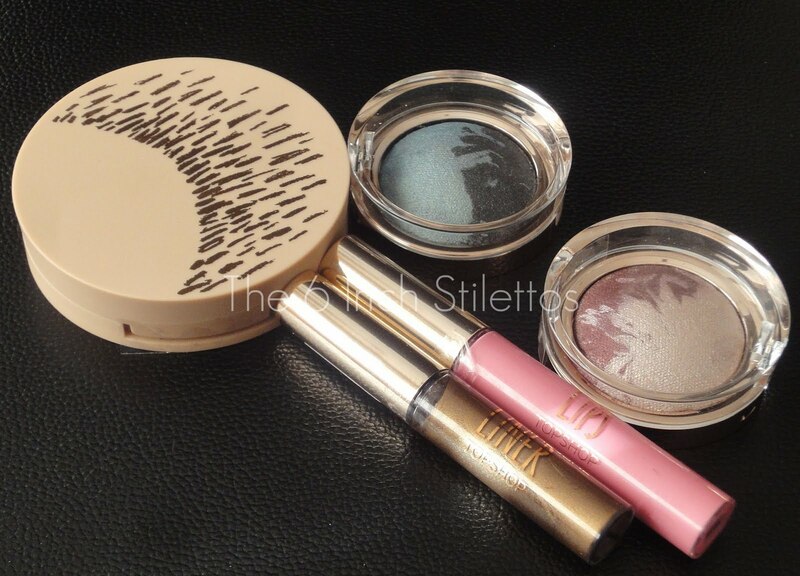 This year, Topshop released their Sandstorm collection and what a gorgeous collection it is! I've done swatches of some of the collection before and you can see those by clicking HERE and HERE and HERE. From cheeks, to lips, to eyes and nails, everything in the collection is very wearable and would probably suit most skintones. 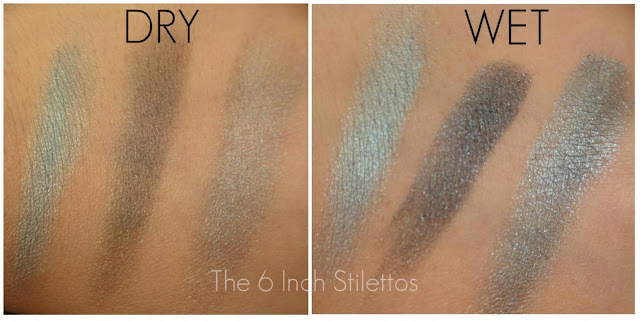 When I took all the products out of their outer packaging I was immediately drawn to the eyeshadows. I love that they are in sturdy plastic containers (I guess that's the best thing to call them) and that everything is uniform with some sort of a gold print or feature to it. 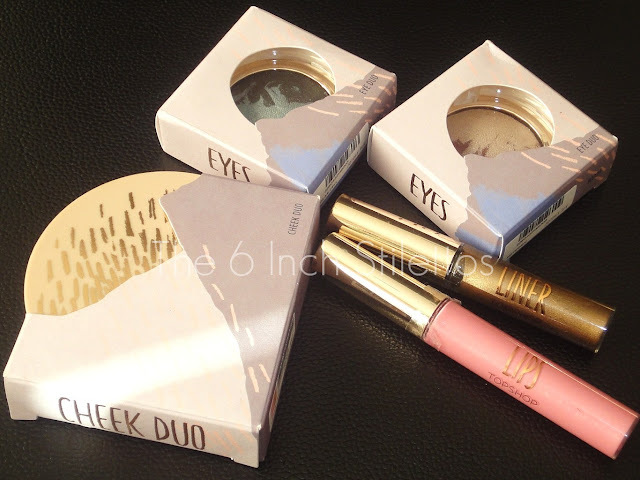 The packaging for the Cheek Duo was kind of boring but it is only a minor setback to what is otherwise a lovely collection. Also, I don't like the sellotape around the lids of the Semi Permenant Eyeliner and Creme Lipcolour but again, those are very minor setbacks. Now, on to the swatcheroonies! From afar, the product looks pretty cool and reminds me of a MAC Mineralize Blush but with two contrasting colours but essentially, these are meant to be a blusher and a bronzer. They have what I can only describe as a flame-like pattern running through the middle which is a nice touch but like all products that always look pretty before swatching, I'm sure that won't be running all the way through so after a few good swipes it probably won't look like that anymore. 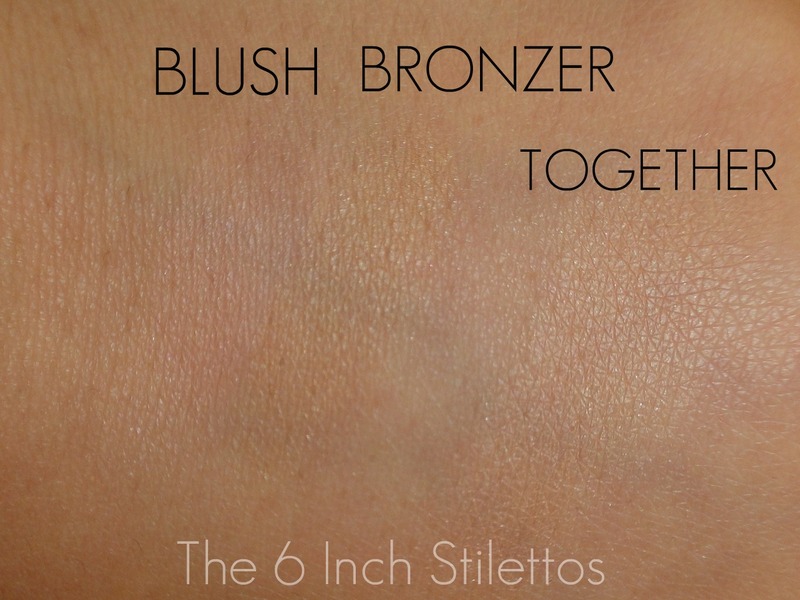 There is a very very subtle sheen running through the bronzer but the pink blush is completely matte so essentially, this could be quite a handy product to have during the summer months when you might just want a natural looking tint. Now, I said "meant to be blush and bronzer" in my previous statement because you cans see from the swatches that there is hardly any colour payoff when they're swiped. I used quite a heavy hand to swatch these and could still get no sort of colour from it so I'm not sure how it would look when applied with a brush as I haven't had a chance to actually use it. You can barely see the colours which is why I've labelled them and I can hardly see the colours swirled together in the third swatch. I probably wouldn't rely on this product as a blusher or a bronzer but maybe as a setting powder on top of my foundation just to make sure it sits while adding a teeny tiny touch of colour. What do you think? 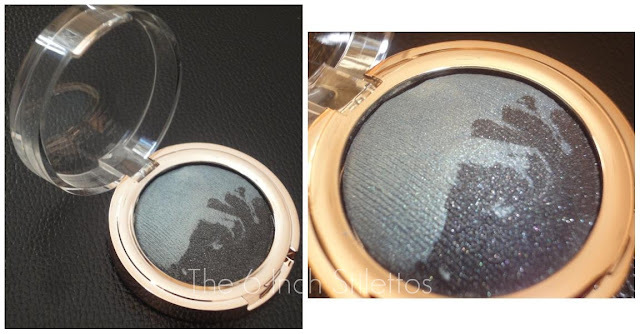 Another product that is very similar to MAC, the duo eyeshadow looks and feels a lot like a baked mineralize eyeshadow that we've seen in stores for a while now. The colour is stunning and I like the flecks of glitter in the darker blue side and think it will give a really gorgeous smoky eye effect for a night on the town. These can be used dry or wet and like other mineralize eye products, the colour payoff when used wet is definitely a lot better than when used dry. When swatched dry, the colour lacks a certain punch and vibrancy whether they are swiped seperately or mixed together. The third swatch in each image is a combination of how the colours look when they are swirled together and I definitely prefer them swirled together when wet. However, keep in mind that I used no sort of primer under either of the swatches above so maybe when they are paired with a decent base, the colours will probably stand out a lot more. This duo appeals a lot more to me when used dry as opposed to it's blue-toned counterpart that I preferred wet. I don't know why but for some reason the colours just look a lot better when I swiped them dry and I saw very little difference in the texture when swiped wet. Strange. Also, there is a major difference when I swirled them together dry and then wet because in the dry swipe, the brown was more prominent whereas in the wet swipe, the champagne took over and drowned out the brown. I'm a big liner fan so when I saw that this is semi permenant, my eyes lit up. I hate it when my liner starts to fade half way through the day and although I love my trust Bobbi Brown Long Wear Gel Eyeliner, it is hard to find a decent coloured one that won't budge while I dance the night away. 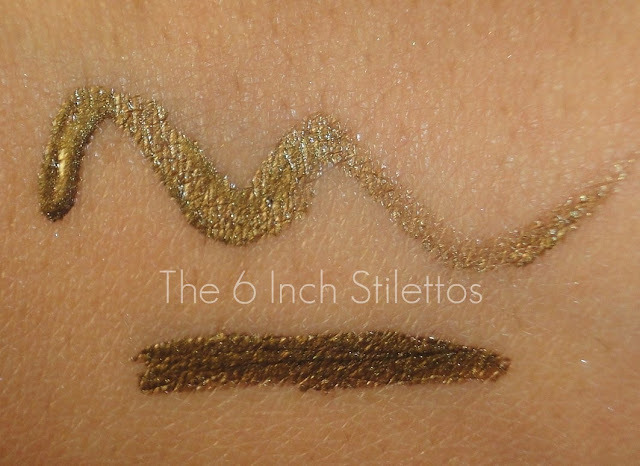 This liner comes in three shades; Tarnished (above), Perpetual (black) and Infinite (dark silver grey). Although I am a big liner fan, I'm also a very fussy liner fan and if I don't like the feel of the brush or even the look of it then it's just not going to make the cut and will end up at the back of the drawer. I'm kind of on the fence with the brush of this product as it is thin enough to be able to do a very discreet slick of gold but it drags the colour along which means I have to go back over it. 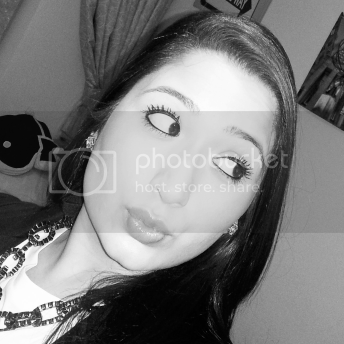 Another pink lipgloss? Yes. Anything special? Not really. I'm not going to lie, I wasn't really excited when I saw this lipgloss but it isn't like I'm running short of them and the colour didn't look like anything amazing either. It's easily duped with all the other brands out there and I don't feel like it is special enough to be part of the limited edition collection. However, if you are on the hunt for a pink lipgloss that is not sticky and moisturising so it doesn't dry out your lips, then I would definitely recommend it. The collection as a whole gets a big thumbs up from me, with some products getting two thumbs up because I think they deserve them. The colours and textures of all products are great considering they are relatively cheap and there is something for everyone in it. The packaging is spot on and considering it is only a high street brand, they are definitely aiming for the high end of the high street as it looks pretty and I would be more than happy to pull any one of the products out my makeup bag. Products that stood out for me are both of the Duo Eyeshadows and the Nailpolishes in Cyclone, along with the Eye Crayon and Lipgloss Stick. Products that blend in to the background are the Cheek Duo and Creme Lip Colour. 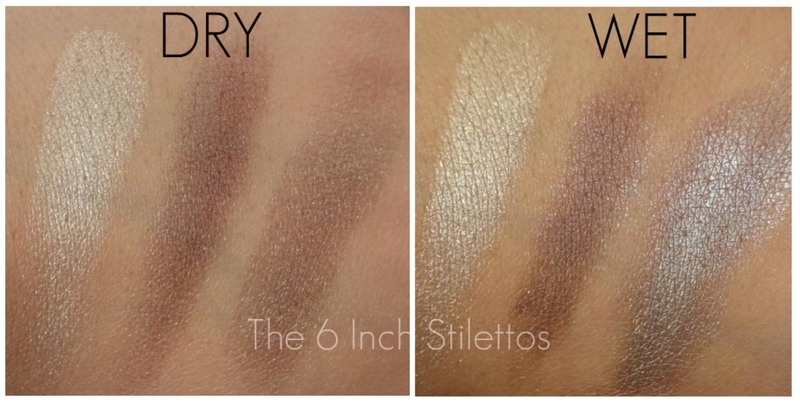 The excitement that I had when I first clapped eyes on them slowly evaporated once I swatched them and saw how boring they really were. The Sandstorm collection is available to purchase now from larger Topshop stores and online HERE. 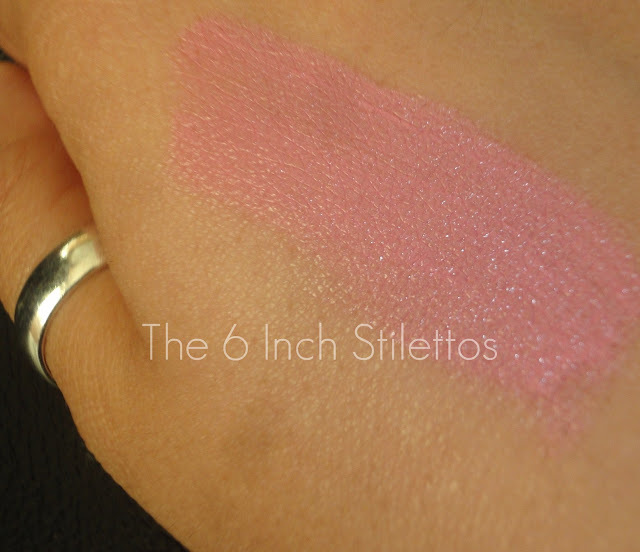 I think the gloss looks really nice, but then, I'm not a pink gloss person at all. I got all excited the blush duo would be a creme duo!